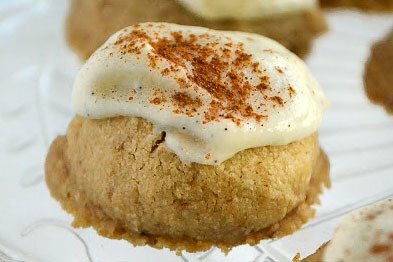 Cappuccino Melting Moments are perfect little bite sized shortbread cookies that literally melt in your mouth ~ they're the perfect after dinner cookie! Cream the butter and the espresso powder. Let the butter sit for 15 minutes to allow the espresso granules to dissolve a bit in the moisture of the butter. Beat again briefly. Add the rest of the ingredients and mix until the dough forms. Refrigerate for at least an hour, or until firm. You can leave it overnight and bake the next day if you want to. Scoop with a 1 inch scoop, or drop small mounds onto a parchment lined baking sheet. You want the cookies to be bite sized. Be sure your baking sheets are cool and not hot from the oven when you set out the dough. Bake for about 11-12 minutes until just lightly browned. Don't over bake. Let the cookies sit on the pan for a couple of minutes, then finish cooling them on a rack. They are delicate, so take care when removing them from the pan. To make the frosting, mix everything together into a spreadable frosting, adding just enough milk or cream for the right consistency. Frost the cooled cookies and dust with cinnamon.